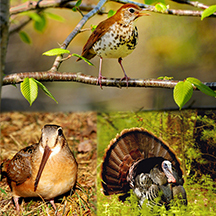 Birds encompass a highly diverse category of species, with subcategories including Forest Birds, Grassland Birds, Raptors, Shorebirds, and Waterfowl. All birds have certain characteristics: feathers, a backbone (birds are all vertebrates), warm-blooded and able to regulate their own body temperature, egg-laying, and wings - though they may not use them to fly, such as penguins and ostriches. According to the International Union for Conservation of Nature (IUCN), 12 percent of birds throughout the world are threatened or extinct. Over 800 species of birds exist either permanently or migratorily in the United States, and 90 of these species (around 11 percent) are on the Endangered Species List 1.